We did not have much time in Milan this trip. 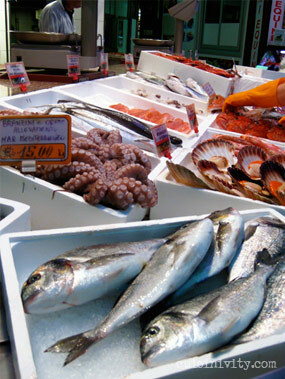 Eating good food is always at the top of my to do list, but in Milan, we also have to go shopping. As soon as we arrived at the hotel from Lake como in the afternoon, we strolled from via Della Spiga to piazza Duomo for some shopping for my fashionista friends and we stopped at La Rinascente for me. 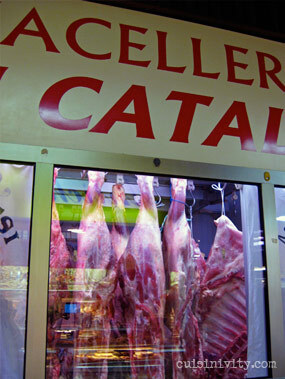 La Rinascente is a department store that sells a variety of gourmet food on the top floor. There is a cafe on this level which has an amazing view of the Duomo. There were so many products to choose from. It was really hard for me to resist buying more. I wished I didn't have to pass through the strict airport checks on the way home. I purchased a bottle of pistachio cream spread, truffled honey and truffled polenta. It was dinner time after we finished shopping at La Rinascente, and we went to a restaurant called Ristorante A Santa Lucia. 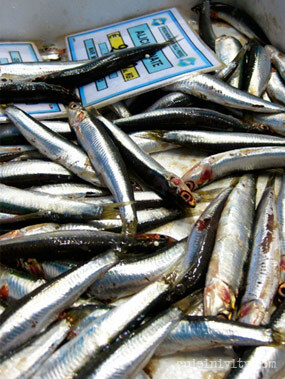 It is also at the piazza, only a few minutes walk from La Rinascente. I usually don't go to the restaurants in the middle of the tourist districts but my friend who we traveled with highly recommended this place. He said even though this place is in the middle of the piazza, it is still popular with locals. 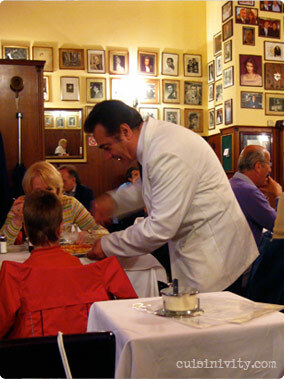 This restaurant opened in 1929 and since then it has been patronized by lots of famous stars. Their walls were filled with portraits. We had carpaccio di filetto rucola parmigiano e noci (beef carpaccio with arugola and parmigiano, 18 euro), 6 filetti di acciughe con burro (home cured anchovies with butter, 12 euro), spinaci saltati aglio, olio e peperoncino (sauteed spinach, 10 euro), spaghetti alla vongole veraci (spaghetti with clam, 18 euro), spaghetti alla sicilliana ( spaghetti with egg plants, 14 euro), and pizza margarita. 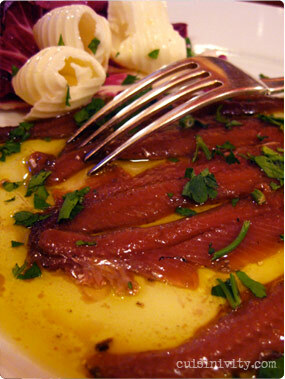 I really liked the anchovy plate which was very salty in a good anchovy kind of way. 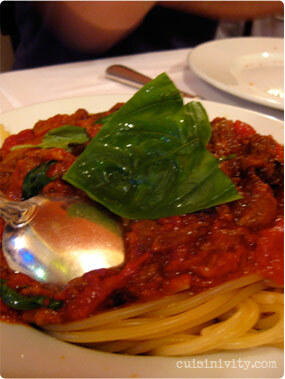 Their pasta dishes were tasty - especially the one with eggplant - but the pasta was a little too al dente for me. We were a group of 6 and it was definitely enough food but we decided to go ahead and order beef cutlets. It arrived on the plate with no other condiments or garnish so it looked and tasted very plain. 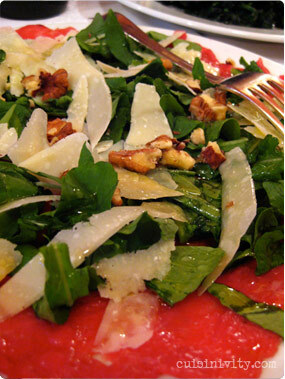 We ordered some lemon wedges and added some grated parmigiano on top and it transformed into a great dish. And of course we did not forget to order several desserts. We had chocolate pudding, a chocolate torte, fresh mixed fruit in proseco and mix berries with ice cream. Nothing seemed to stand out but basically it was because we ate too much before that. Unfortunately, my camera died in the middle of dinner so I could not capture everything. Overall, the quality of food here good with a friendly service (although a little too pushy with their recommendations). The price was not super high despite their location but restaurants are expensive in Milan in general. It is a good choice if you are already in this area to see the Duomo. Thanks to my friend who knows that I am crazy about mushrooms and truffles, she took me to this mushroom specialty store right next to the Wagner metro stop. 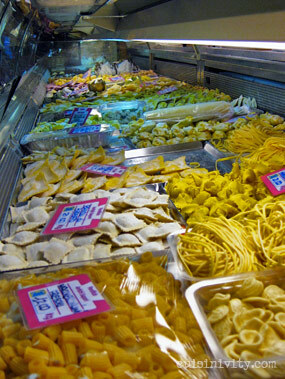 They have a wonderful selection of dried mushrooms, marinated mushrooms, mushroom pastes, truffles and other Italian staples like olive oil, aged balsamic and dried pasta. 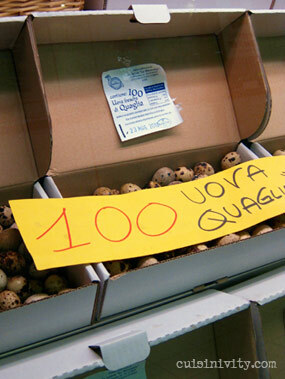 They are much more reasonable than other gourmet food stores like Peck or La Rinascente so if you are like me and want to buy a suitcase full of mushrooms (why did I bring such a small bag? ), this is the place for you. I got one big bag of porcini mushrooms, two bags of chanterelle mushrooms and one bag of morel mushrooms, all for a total of 30 euro. 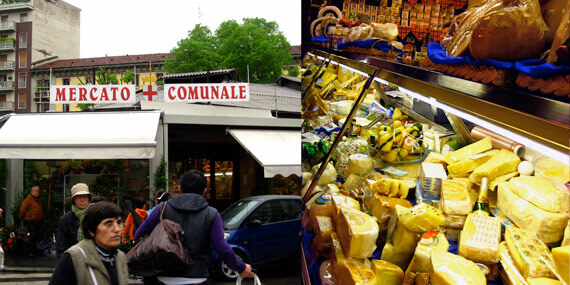 One block away from La Fungheria, there is a local market which was our next destination to get some parmesan cheese. There are several cheese vendors there but we went to one that my friend always goes to. The store will vacuum pack the cheese for you. 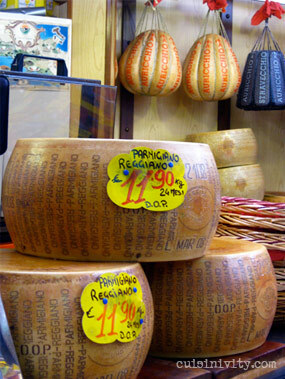 I got about 270g of parmesan for 5 euro. I wish I could take a whole wheel with me. And look at their pasta! On my last night in Milan, we were invited to a house party hosted by our new Milanese friends. They are in the fabric and umbrella business in Milan and their beautiful flat is in the center of the city. Their house is filled with umbrella art and paintings without an empty space on the wall. Such an impressive and warm flat. Francesca is an amazing cook too and she told me that she has a passion for cooking. That night she fixed very simple yet delicious appetizers washed down with a glass of kir while she was finishing dinner. The dinner was ripe avocado and shrimp salad, pork meatloaf with a fruit chutney and mustard sauce, chopped chicory salad and fresh fruit with fluffy cream and yogurt sauce. Believe or not, she fixed this meal on the fly. She did not know that we were coming to dinner so had no way to have planned all this in advance. Buonissimo! After dinner, Chino opened a very nice grappa for us. He showed us how to do grappa tasting. He told us to put our index finger in the glass and rub with thumb very very hard. If you smell a nice woody aroma, it is a good grappa. This grappa was only 40% (80 proof) which on the lower side (usually 38% to 85%) so it was very smooth and you could actually enjoy the flavor. Thanks to Francesca and Chino for a wonderful dinner. It was such a perfect way to end my trip.